In Aussie and Kiwi pie shops, savory hand-held meat pies are an iconic snack. They typically have a double crust but this recipe starts with flaky pie crust filled with delicious ground beef and gravy, and is then topped with creamy mashed potatoes instead of a second crust. The individual pies make for a really hearty meal and pair well with a fresh green salad. They’re considered a national food and are an indispensable snack at rugby and football games. Today, these meat pies come in all sorts of varieties, including vegan, where soy protein takes the place of the meat. 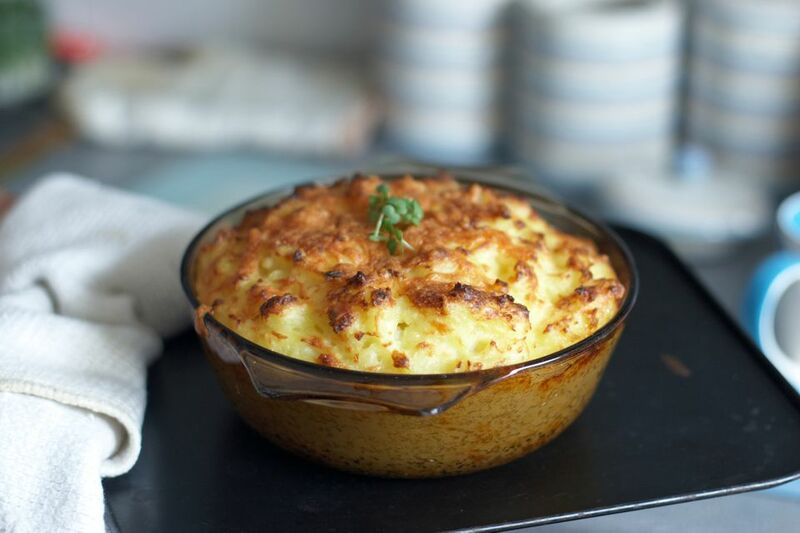 The difference between this recipe and shepherd’s pie is that the latter has no bottom crust. To make the potato topping: Place the potatoes in a large, heavy saucepan. Add enough cold water to fully cover the potatoes. Bring to a boil. Reduce heat and simmer, partially covered, until potatoes are tender, about 10 to 15 minutes. Drain the potatoes in a colander, then return to pan and add the milk, butter and salt. Use an electric mixer to beat the potatoes until smooth and creamy. Alternatively, cream using a potato masher. Set aside to cool. To make the beef pie filling: Heat the oil in a saucepan over medium-high heat. Add the onion and fry for 3 to 4 minutes or until soft and translucent. Add ground beef and cook for 3 to 4 minutes, stirring and breaking up with a wooden spoon until browned. In a separate bowl, combine cornflour/cornstarch and 1 tablespoon of beef stock and stir well. Set aside. Add remaining beef stock, tomato paste, Worcestershire sauce, and Vegemite to beef. Stir well to combine. Add cornflour/cornstarch mixture and stir. Bring to a boil. Reduce heat to low and simmer for 10 minutes or until thick. Remove from heat and cool. Place pie tin, face-down, on first pastry sheet and cut a circle that's slightly larger than the tin (about 1/2 inch bigger) — this is the pie base. Repeat process to make another 3 bases. Press base pastry into pie tins and gently press pastry up the sides. Fill with meat mixture. Brush rims with water. Spoon mashed potato into piping bag fitted with nozzle and squeeze potato topping in a pinwheel motion on each pie to cover the meat filling. Place pies on a baking tray and bake for 20 minutes or until the potato filling is slightly golden. Serve with ketchup.